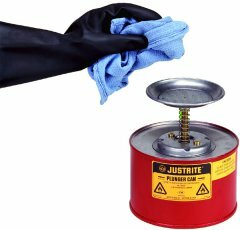 The best way to handle flammable liquids used in "sponging" and cleaning applications. Can has spring-loaded plunger with perforated-metal, fire-baffle dasher. Depressing dasher moistens rag or sponge while surplus drains back into can. Powder coat finish is fire engine red for high visibility.